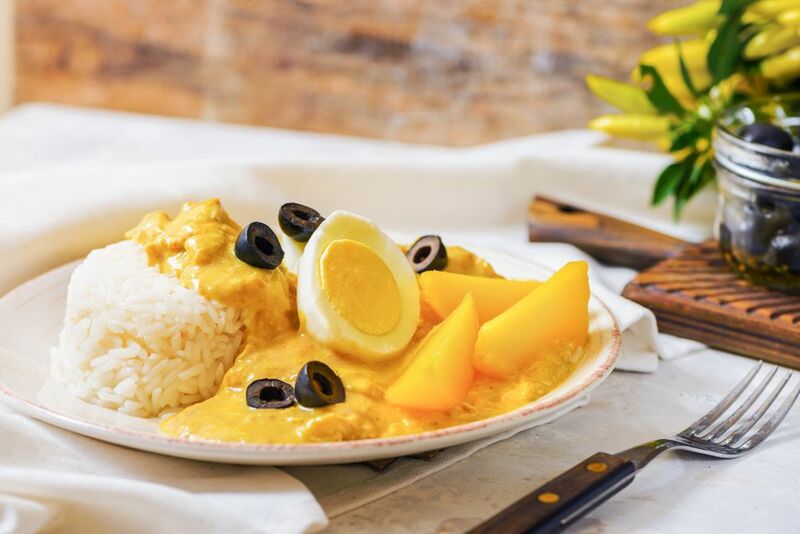 Aji de gallina is a delicious Peruvian classic — slightly spicy and bright yellow from the famous aji amarillo peppers, and rich from the unusual cream sauce made with ground walnuts. This dish is traditionally served over rice with boiled yellow potatoes and black olives. You can buy frozen yellow aji peppers (they often look more orange than yellow) at Latin food markets. You can also find jarred aji amarillo paste, which works well too. Cook the yellow potatoes in salted water until tender when pierced with a fork. Let cool, peel, cut into quarters, and set aside. Place the chicken breasts in a pot with the chicken stock and bring to a simmer. Cook for 10 to 15 minutes until chicken is just barely cooked through. Strain broth and reserve 2 cups. In a blender, process peppers with the vegetable oil until smooth. Sauté the garlic and onions with the puréed peppers and oil until the onions are soft and golden. In a blender or food processor, process the evaporated milk and bread mixture with the nuts and Parmesan cheese until smooth. Add the cooked onion mixture and process briefly. Return onion mixture to pan, and add 1 1/2 cups of the reserved chicken stock. Bring to a low simmer, and stir in the chicken. Heat until warmed through, adding more chicken stock if the sauce is too thick. Serve over rice, garnished with the yellow potatoes, slices of hard-boiled egg and black olives. If you can't find aji amarillo peppers, then substitute another hot chile pepper and add a yellow bell pepper for color.